Couchbound during the first trimester of my second pregnancy, I watched my now favorite movie, Top Hat, over and over. Funny—verging on naughty—and appeasing, the film showcases Fred Astaire‘s irresistible charms as he sings and dances to woo his consort Ginger Rogers. (Sylphid Rogers nearly made me puke— over-stuffed with Thanksgiving provisions and fuel as I was—the first time I saw the opening scene of Gold Diggers of 1933, when she sang “We’re in the Money” in pig-Latin. Do NOT watch that number with an overly full belly topped-off with scullery lube! “No Strings (I’m Fancy Free),” the first song in Top Hat, brings to mind more carefree times, say, before you had children. Remember that summer you stayed at the lake almost every weekend? Jamaican jerk turkey thighs, wild salmon, grilled steak, summer veggies, pasta salad and watermelon. How did you ever have time to make dessert? 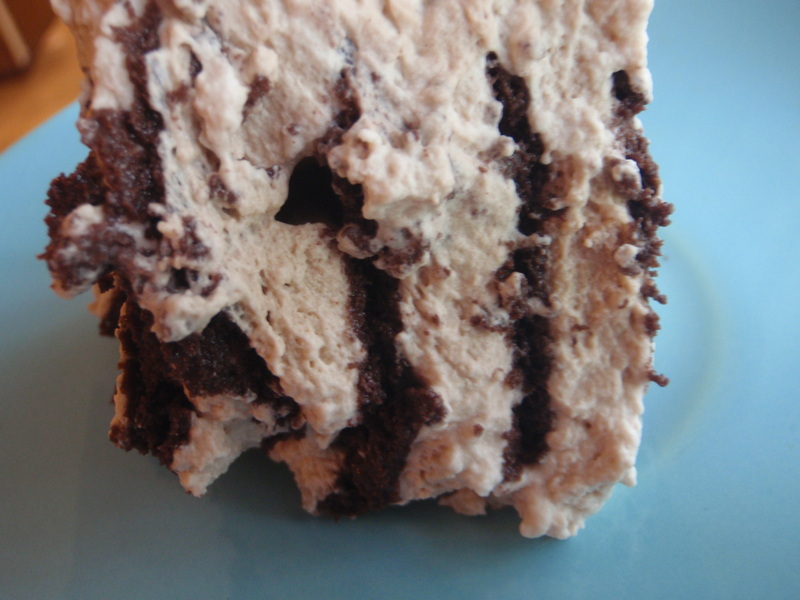 You probably whooped up a simple ice box cake. Because it must be made 2 days ahead and comes together very quickly, an ice box cake saves you plenty of time for marinating your meats and cutting your vegetables. Plus it’s delicious! Who besides Austin Farm to Table 😉 and my own kindergartner doesn’t love whoop cream—and chocolate cookies? If you find yourself in the neighborhood of low-price champs Natural Grocers, pick up a quart of Iowan Farmers’ Creamery whipping cream for only $5.79. You’ll be creamed up for two sets of cool desserts: the easy, easy Ice Box Cake and a seductive Crème Brûlée. Can’t beat butterfat! scant pint of heavy or whipping cream, organic or local. Look for Organic Valley (organic) and Promised Land (Texas) at the usual stores or the non-homogenized, low-heat pasteurized Farmers’ Creamery brand at Natural Grocers. 1 Tablepoon turbinado sugar. I buy this in bulk and we go through a lot of it—for iced coffee and ice tea. I bring an old 3# peanut butter jar and have the staff tare the weight for me. 1 Tablespoon instant espresso powder. Medaglia d’Oro is the standard. about 54 Salem Baking Company “Artisan Chocolate Blend” Moravian Cookies. That’s a little more than one box. These labor-saving cookies aren’t cheap—at $4.99 a box (Central Market price) they’re a treat. They are all natural and trans fat-free, however, unlike Nabisco’s Famous Chocolate Wafers. Line a 1½-quart dish with two crisscrossed overhanging lengths of plastic wrap. I use an old Pyrex baking dish approximately 8¼” X 6½”. With a cold beater or whisk, whip your cream to firm peaks. Please don’t overbeat the cream. Keep it smooth. Place a generous one-half of the whipped cream into the lined container, spreading it to the edges. Insert the cookies upright into the cream. For my dish I configure the cookies in three very slightly overlapping rows of 18 cookies each. Scrape the rest of the cream into the dish to top the cookies and spread the cream evenly to the edges. Rap the container gently on the counter top a couple of times to settle the cream, then wrap the cake snugly with the plastic wrap. I like to turn the cake out at this point and replace it upside down into the dish, but that’s just being persnickety. I’m sure the components will even themselves out if left alone. Let the cake sit in the fridge for 2 days. The cookies absorb the cream’s liquid and turn cakelike, leaving you with thin layers of chocolate bound and filled by a thick and flavorful whoop cream. Now get onto your wakeboard and go! I don’t remember who sang that milkshake tune, not that I even knew who the artist was when the song first came out. But I do remember the mint chocolate chip shakes I used to get at Mad Dog’s a couple decades ago, and that reminds me about Central Market’s in-store coupon for free CM Organics ice cream pints (including their mint chocolate chip flavor, which kept our kids in good spirits on a recent drive to Rockne) when you buy a package of CM’s $4.99 frozen filled pastas (not organic, but all natural and handy). We love the pumpkin variety, unfamiliarly accented with the bitter almond sweetness of amaretti cookies in the filling. Tossed with fruity olive oil (or butter), grated pecorino romano and plenty of freshly cracked black pepper, these mezze lune rise to the occasion, quick to wax into a delicious dinner. If you’re wondering where to put another pint of honest cream (onto your hips, of course, but let’s get gustatorial first), try a rich dish of crème brûlée. Local egg yolks, organic sugar and real vanilla set your custard into a densely creamy bed onto which you burn a sweet, crackling taffeta of turbinado. Light it up! 6 or 7 local egg yolks. I like to weigh these out, in which case I go for about 120 grams. 1/3 cup organic sugar. Costco offers the best deal on Wholesome Sweeteners 10# bag. Otherwise, check your bulk departments and Central Market and Whole Foods store brands. small pinch of salt. I use Real Salt. ½ vanilla bean (best), or ½ Tablespoon vanilla bean paste (next best and easier), or ½ Tablespoon great vanilla extract (most convenient). Nielsen-Massey brews full-flavored vanilla products, including paste and organic extract, and packages fragrant, supple vanilla beans. If you’re using a vanilla bean, split it down the middle with a sharp paring knife and scrape the seeds into 1 cup of the cream in a small saucepan. Add the bean, 1/3 cup sugar and salt and set the pan on the stove over medium heat. Bring the cream just to a boil, stirring to dissolve the sugar. Remove the pan from the burner, cover and let the cream steep for 15 minutes before removing the vanilla bean (rinse the pod well, let it dry and repurpose it, tucked into a bottle of homemade vanilla extract or a jar of sugar.) If you’re using vanilla bean paste or extract, just stir the flavoring into 1 cup of the cream. Preheat your oven to 300°. Lay a washcloth on the bottom of a large (at least 11″ diameter) baking dish. Heat up a quart of water to pipin’ hot. 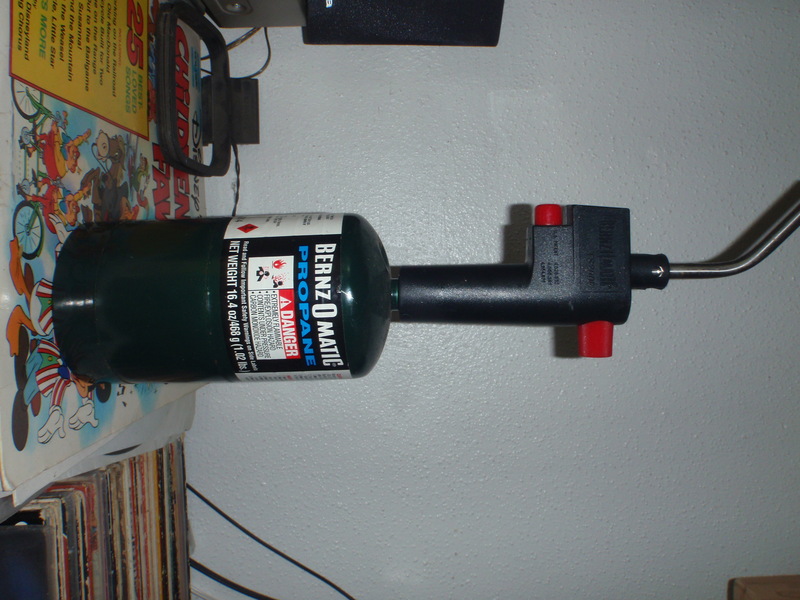 I use a 1-quart glass measure and heat the water in the microwave. Combine the remaining cup of cream with the yolks and whisk gently to blend well. Pour through a fine-mesh strainer into the pan of cream, whisking it in as you go to distribute the heat. Set an 8″ round baking dish into the larger pan on top of the washcloth. I use a Pyrex cake pan. They’re cheap even when new but you can usually find all manner of Pyrex goods (and other bakeware) at the thrift stores. Pour the custard into the smaller baking dish. Set the whole bain-marie into the oven on a middle rack. Carefully pour the hot water into the larger pan to come up to about 2/3 the height of the custard dish. Bake. When the custard looks set, check its temperature with an instant-read thermometer inserted into the middle of the puddin’. You’re looking for 170° to 175° F. Start checking at about 35 minutes. When the crème tests done, carefully remove the 8″ dish from the water bath and set it on a cooling rack to cool for a couple hours. Once it reaches room temperature, place the dish in the fridge to chill for at least 4 hours, overnight is fine. When you’re ready to fire it up, blot any condensation on the surface of the crème with a paper towel and evenly sprinkle the turbinado sugar all over it. Light your torch and move the flame across the surface of the custard to melt and caramelize the sugar. Let the fire lick it good, up close and personal, to quickly brown the turbinado. 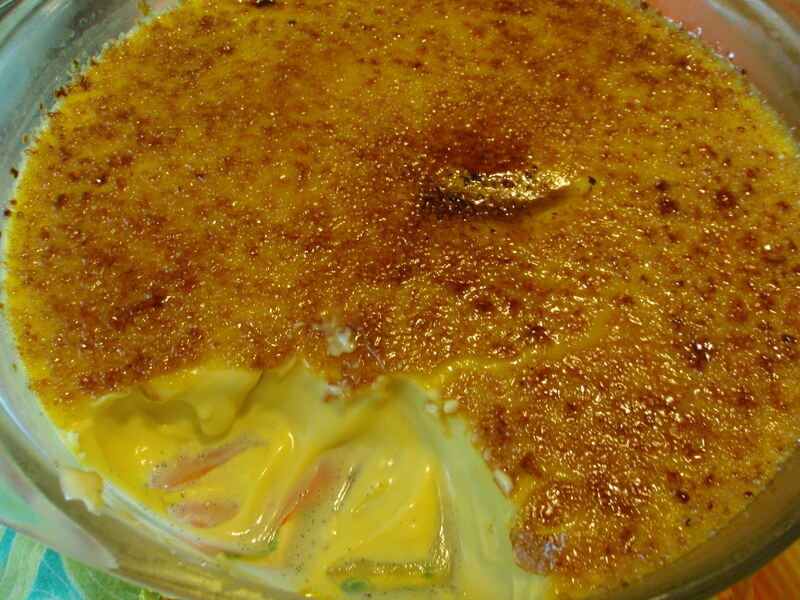 Place the crème in the fridge, uncovered, to chill for 30-45 minutes before serving. 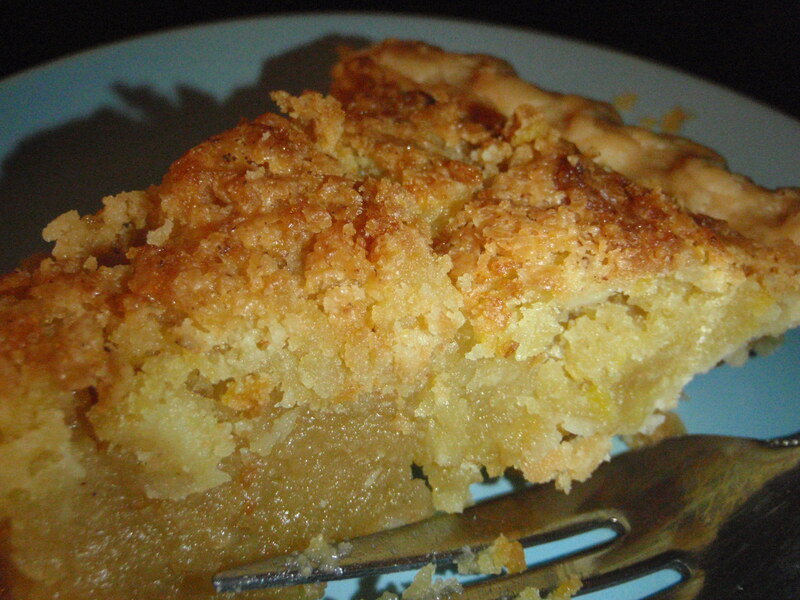 Eat right away, before the sweet crackling crust softens. Although it will still taste delicious later, you’ll lose the dramatic contrasting crunch. Then you can enjoy it as crème caramel! 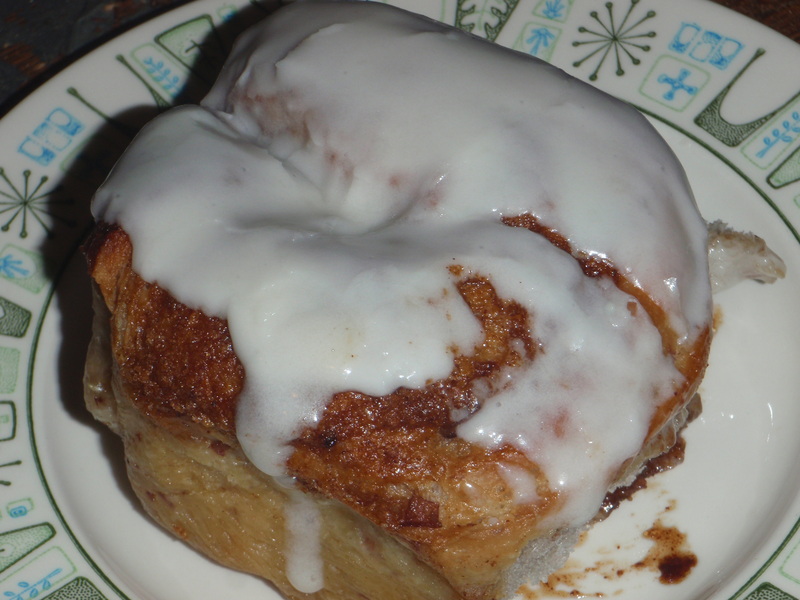 Taking advantage of sales and utilizing leftover potato cooking water, I baked up a batch of sweet and puffy cinnamon rolls. The surprise ingredient? Eden Foods organic canned aduki beans. Why not? 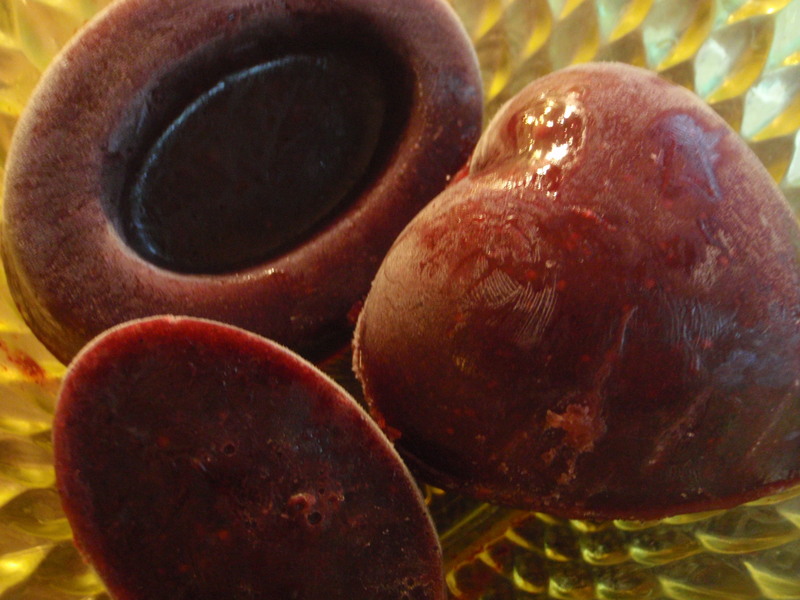 In Asia aduki beans (also called adzuki or azuki) frequently show up in sweets. From Chinese moon cakes to Japanese ice cream and Thai shaved ice, aduki beans make life a little sweeter. Or a lot sweeter, as in the case of these here buxom buns. You’ll be happy to know that Eden Foods canned beans (on sale now at Whole Foods, four 15-ounce cans for $7) are at this time the only beans canned commercially in BPA-free cans. With a great many varieties from which to choose, including harder to find legumes such as black-eyed peas, black soy beans and the adukis, you’ll be beanin’ with joy! The aduki beans make this dough tender, moist and light. 1½ cups potato cooking water. Newflower Market’s selling organic russets at $2.50 for a 5-pound bag through March 17. Get spudsy! 2 Tablespoons organic or local butter. Organic Valley is my favorite all purpose butter. Click for a coupon. 1 generous cup well-drained aduki beans. I used Eden Foods brand. You can use home-cooked. 1½ teaspoons salt. Use a scant measure if your potato water was salted. Mine almost always is. 2 teaspoons turbinado sugar. I buy this in bulk at Central Market. I bring my own container and have the staff tare the weight for me. 500 grams unbleached bread flour. I like King Arthur brand. Whole Foods usually has the best price on the 5-pound bag. 2 Tablespoons organic quick oats. Buy this in your favorite bulk department. I stock up during sales and store it in the freezer if I’m not working through it quickly. 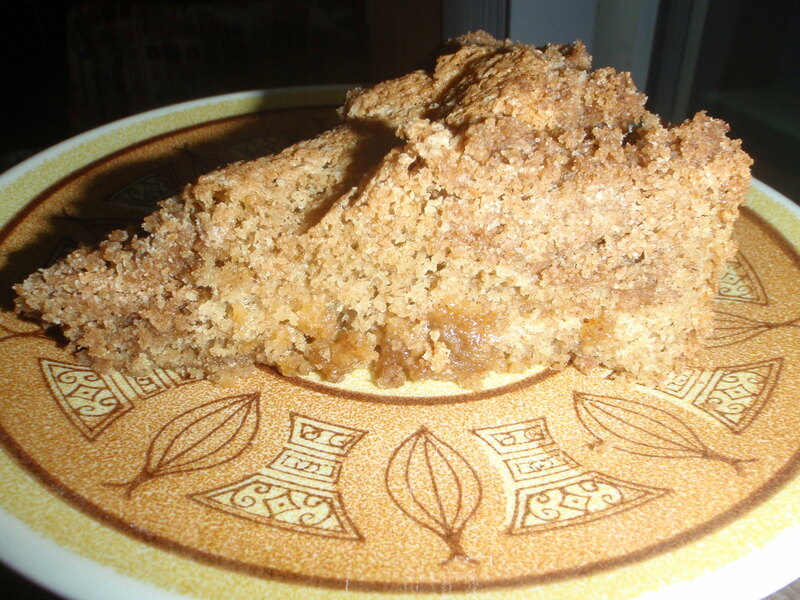 1 Tablespoon organic or local whole wheat flour. I love Richardson Farms locally grown, freshly-ground flour. 1½ teaspoons instant yeast (bread machine or rapid rise). NOT active dry. 4 Tablespoons softened butter. Organic Valley Pasture butter is especially tasty here. You’ll find it on sale at Whole Foods for $3.39 right now. Lucky Layla (available at Central Market) and Way Back When (available at our farmers markets and from Greenling) are Texas options for high-butterfat, lightly salted beurre. 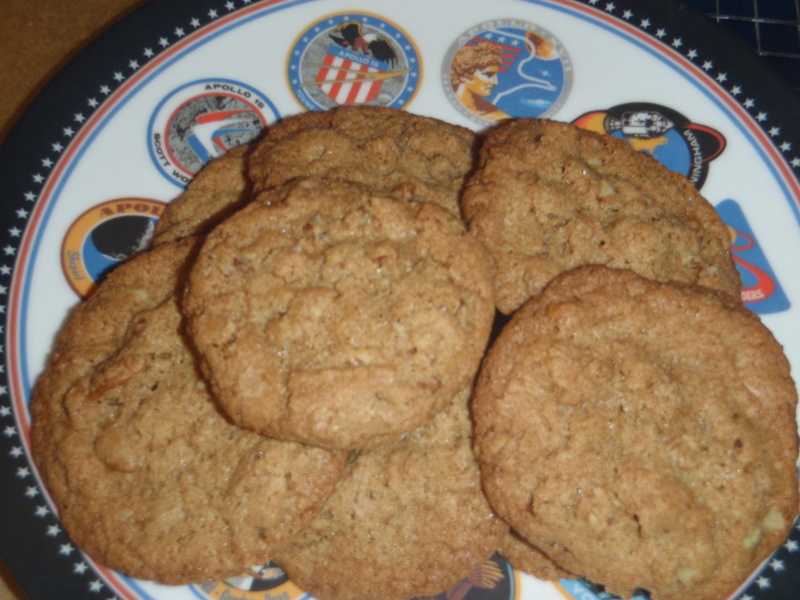 206 (1 cup) grams organic light brown sugar. Central Market’s brand is on sale now at $2.50 for a 1½ pound bag. 1½ ounces (3 Tablespoons) organic cream cheese, softened. CM’s brand is usually the best buy. 3 Tablespoons yogurt. I make my own from local goat milk. Click to read how. I like Swede Farm Dairy and Wateroak Farm, both at the farmers market in Sunset Valley. 174 grams organic powered sugar. CM again, with a sale price of $2.50 for a 1½ pound bag. I don’t bother to sift for this glaze. I’m too rushed (distracted? lazy?). I use my bread machine’s dough cycle to mix up the dough and give it a first rise. For my appliance I add the ingredients in the order listed. Your machine’s instructions may vary. You can mix the dough by hand or with a stand mixer, too. Combine the dry ingredients with the yeast before mixing in the rest. Knead until you have a smooth and bouncy dough. Let rise for about 2 hours at coolish room temperature. Meanwhile line a 9″ X 13″ baking pan with aluminum foil. I turn the pan upside down and drape the foil to the outside of the pan before putting the foil on the inside. Butter the foil very well. With floured hands pat the dough into a rectangle on a floured surface. I love non-stick silicone rolling mats for bread work. Using a floured rolling pin, roll the dough out to approximately 12″ X 16″. Spread the surface of the dough with the softened butter to within ½ inch of the edges. Combine the brown sugar and spices (including salt, if using) and spread all over the buttered surface, patting it in a bit. Starting with a long edge, roll the dough up jelly-roll style into a tight log. Using a sharp chef’s knife or bench knife, cut the dough log into 12 equal pieces, one at a time, placing them into the prepared pan as you cut. Loosely cover the pan of buns with a piece of plastic wrap—I reuse plastic bags that I’ve washed in the (clothes) washing machine (yes, you can! ), cutting them open for greater surface area. Let the buns rise for about 1¼ hours, until puffy and well-risen. 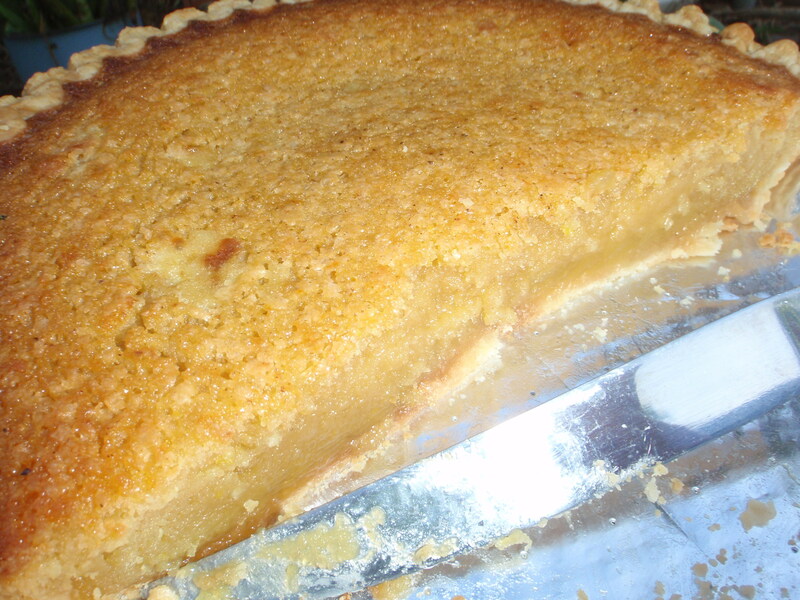 Gently brush with the melted butter before baking in a preheated 350º oven for about 35 minutes. The rolls should be browned and test done when a middle bun is poked in the dough with a bamboo skewer. Using the foil as a sling, lift the rolls out of the pan and place them on a cooling rack. 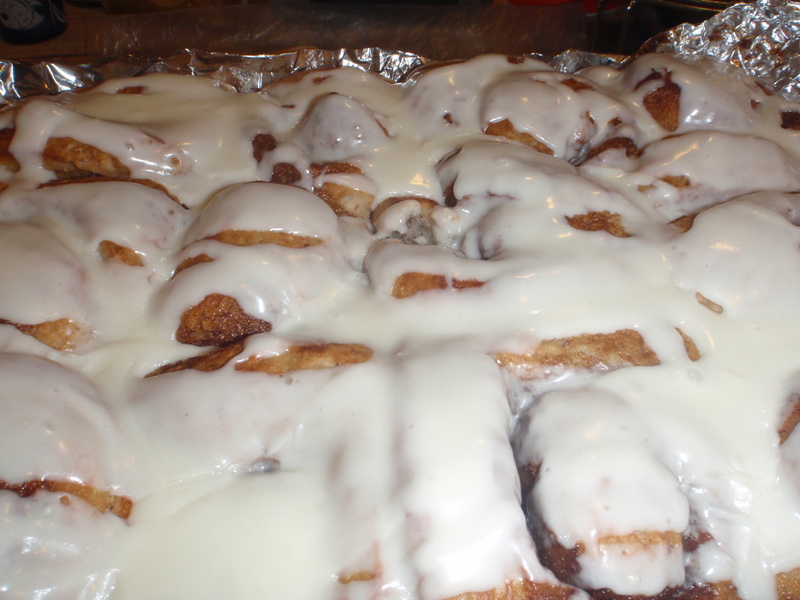 Let them rest for 5 minutes while you whisk together the glaze ingredients (cream cheese through the vanilla). After 5 minutes, drizzle the glaze over the rolls, separating them first if desired. Now that I’ve discovered the technique of sifting most of the bran out of Richardson Farms locally grown, fresh-ground whole wheat flour (see Texas Bread) I’m really on a roll. Or a cookie. Here’s a crunchy, buttery Texas cookie filled with local pecans. Easier than pie, a batch bakes up ’bout as fast as you can eat ’em. Tell your sweet tooth to go local! ½ teaspoon baking powder, sieved. I use Rumford, aluminum-free and non-GMO. 6 ounces local or organic butter, cut up. Organic Valley‘s my standard. Click for a coupon. Look for Lucky Layla (that’ll make a very rich cookie!) at Central Market or Way Back When at the Sunset Valley Farmers Market and Elevated Artisanal at the Austin Farmers Market. ¾ teaspoon salt. I use Real Salt. 152 grams (¾ cup) organic brown sugar. CM’s brand sells for $2.99 for a 1½ pound bag. 150 grams (¾ cup) organic sugar. Costco has cornered the market on Wholesome Sweeteners 10-pound bag for only $7.77. Otherwise, CM’s 2-pound bag still sells for $2.99. 2 teaspoons vanilla extract. I like Nielsen-Massey. 1 Tablespoon organic apple cider vinegar. Whole Foods 365 brand usually sells for the best price. I buy the big ole quart bottle. 2 2/3 cups Texas pecan pieces. At the downtown farmers market, Star J Farms sells a 3-pound bag of sweet nuts for $22. Whisk together the dry ingredients. Cream the butter with the next four ingredients (including optional zest) until well blended. Beat in the egg, vanilla and vinegar. Stir in the flour mixture and pecans until well-mixed. Drop dough by 2-Tablespoonfuls (a spring-loaded scoop works great here) onto a parchment paper lined baking sheet (I use If You Care brand), spacing cookies about 3″ apart. Bake for about 14 minutes, rotating cookie sheets halfway through baking, until browning around the edges. Cool on pans on cooling rack for 5 minutes. Place cookies on racks to finish cooling.